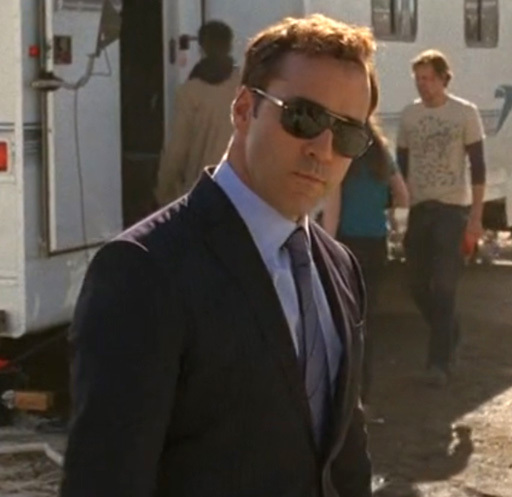 Super sunglasses Fall 2010 collection is set to arrive. 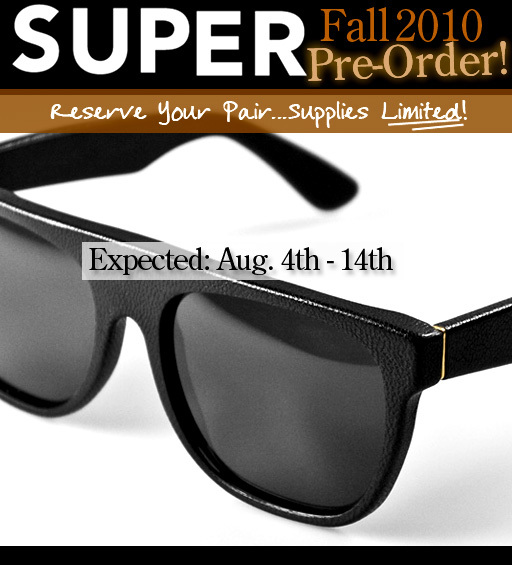 RetroSuperFuture’s fall line up will have smart new colors as well as some nice use of different materials; Including the Flat Top opulently wrapped in top notch Italian leather, plus metal/acetate combination versions of the People and Lucia. Pre-Orders are now open for the new leather flat top. The other pieces haven’t been leaked and cant be shown yet, but will be up as soon as they arrive. The delivery is set to arrive august 4th-14th and we will be among the first to have them in the states. Production is limited so reserve your leathers now and be sure to check back for the complete fall drop. 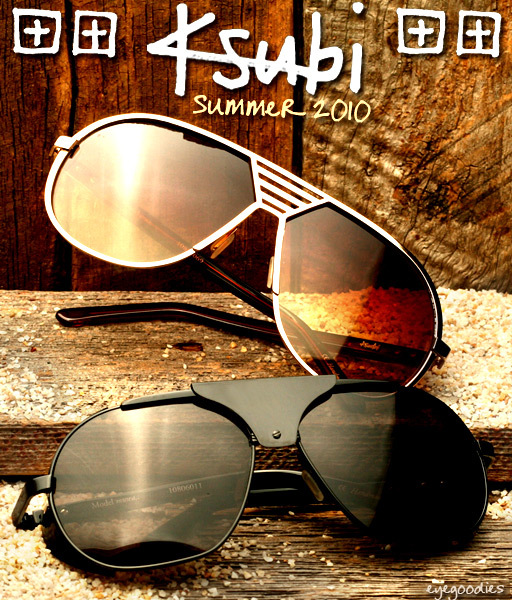 Eyegoodies.com is proud to welcome, quite possibly Australia’s most iconic fashion brand, KSUBI. 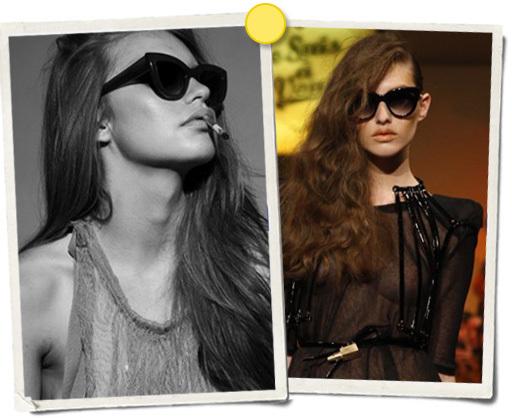 Founded in 2000 by Dan Single and George Gorrow, Ksubi sunglasses are simple yet built with an eclectic mix of styles. The collection is inspired by pop comic, steam punk and vintage, creating a contrasting but unified & original look. Each sunglass model is a “piece” in its own right, with subtle branding, quality craftsmanship, attention to detail, and originality; Definitely worth checking out. 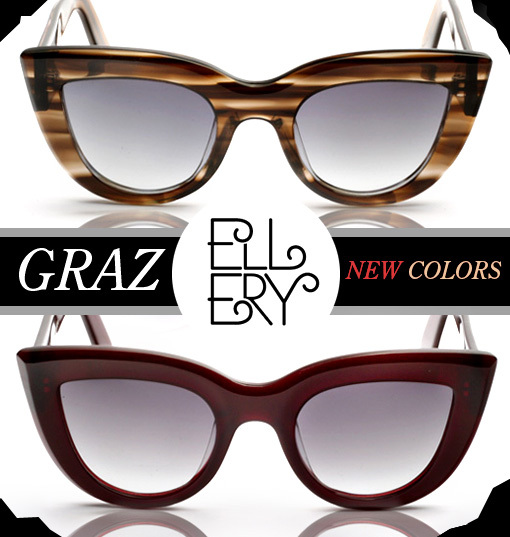 Graz Ellery Sunglasses now available in new colors plus restocked in black. Just in from Australia two new colors of the limited edition Graz x Ellery sunglasses. These very current, chic, cat eye sunnies are now available in a stunning deep blood red and streaked amber tortoise.